(Photo: REUTERS / Alessandro Bianchi)Pope Francis reacts as he delivers his Sunday Angelus prayer from the window of the Apostolic Palace in Saint Peter's Square at the Vatican July 27, 2014. The Pope made an impassioned plea for peace in the Middle East, Iraq and Ukraine. Pope Francis has called on humanity to use "weapons of love" and not to forget the throngs of migrants and refugees fleeing war, hunger, poverty and social injustice. 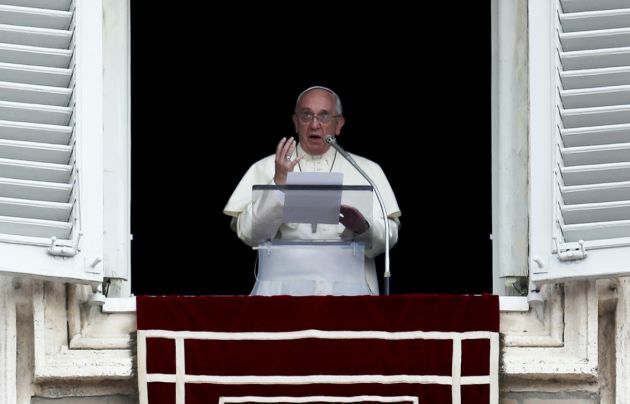 In his Easter message from his balcony at St. Peter's Basilica the Pope condemned the "spiritual and moral abysses of mankind" that "provoke hatred and death." Francis said, "With the weapons of love, God has defeated selfishness and death." The Archbishop of Canterbury, Justin Welby, preaching at Canterbury Cathedral spoke of a week of terror in Europe and the Middle East by extremists. "Fear is reasonable, a normal human reaction. This week has shocked all of us, and risks causing us to act fearfully, to see a world in which fear triumphs. "Easter proclaims to us in flesh and blood that fear and death and terror are not the last words," said Welby. "Terror speaks of a world at war with itself, of Faiths at eachothers' throats. Jesus Christ reaches out not in exclusion but in embrace. This is the feast of the victory of God, and we celebrate in the midst of darkness, by our worship and praise shining an unquenchable light." Popes use the Easter Sunday Urbi et Orbi address, "to the city and the world" to review matters of global importance. Francis spoke about the World Humanitarian Summit scheduled for May in Istanbul urging it to center "on the human person and his or her dignity"
The pontiff said he hoped it will "come up with policies capable of assisting and protecting the victims of conflicts and other emergencies, especially those who are most vulnerable and all those persecuted for ethnic and religious reasons." The Pope said, "The Easter message of the risen Christ, a message of life for all humanity, echoes down the ages and invites us not to forget those men and women seeking a better future." On Good Friday, Francis said the Mediterranean and Aegean Seas "have become insatiable cemeteries, reflections of our indifferent and anesthetized conscience."